My photography plans failed miserably on this evening as the clouds chose not to cooperate. That's often the way it goes with nature photography and why it sometimes takes me years to get an image I'm after. On my way back down Flattop Mountain on Saturday night I saw the sky brightening in the east. I had forgotten about the moon rise that night. I quickly got out of my skis and setup my equipment hoping for something special and I wasn't disappointed. 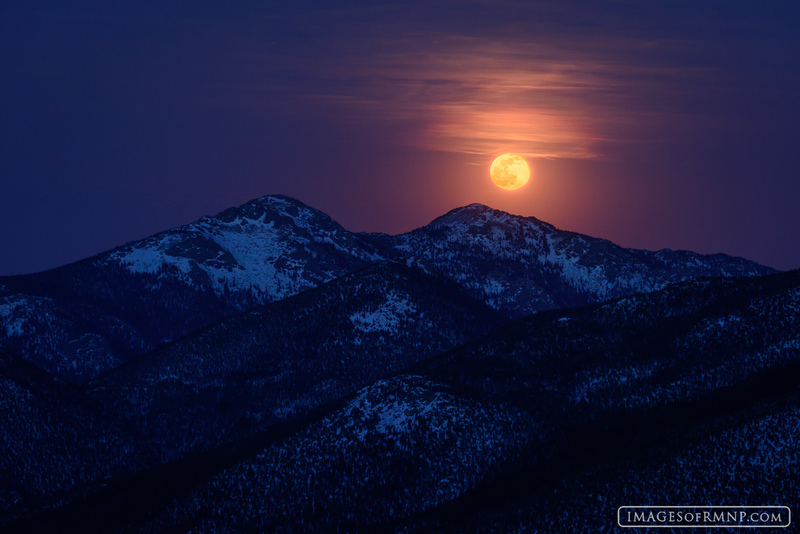 A beautiful harvest moon rose over Twin Sisters. It was so rich and colorful that it was truly breathtaking. Sometimes we don't get what we hope for, but if we pay attention we might get something even better. Photo © copyright by Erik Stensland.